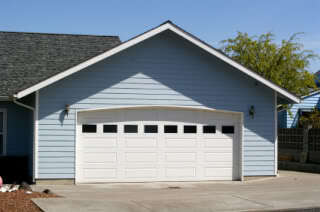 A garage door is an important part of your home. Not only is it a major part of your home’s external appearance, but it also protects your property. If it stops working, your car and/or other items can be trapped or vulnerable. What’s more, a broken garage door poses a serious safety hazard to children and pets. Additionally, in colder regions like Saint Paul, a garage door that doesn’t shut all the way or is stuck open will let in cold air, causing a substantial increase in your heating bill. If your garage door is stuck, it could be a minor issue that can be resolved easily. Before calling a professional garage door repairman, there are a number of things you can check out on your own. If your garage door is electric and it won’t respond to the remote control, make sure the batteries in your remote control are okay. They may be dead, or just placed the wrong way. This is the most common reason why garage doors stop working. If you’ve replaced the batteries and there is still no response, the next thing to check is the garage door’s electric eyes. All electronic garage doors have two electric eyes that face each other, creating an invisible light beam between them. If the eyes are not properly aligned or something is blocking either of them, the door won’t budge. Make sure the eyes are clear and that they are aligned. It may take a few attempts to properly align them is they have moved. If that doesn’t solve the problem, there are a few more options you can look into on your own, but only if you have some experience with repairs and garage doors. A garage door can be a dangerous thing, so only try the following if you feel you know what you are doing and will be safe. Examine the garage door’s track. Small items like pieces of wood or tools can fall onto the track, immobilizing the door. If you find an obstruction, remove it, and see if the door begins functioning again. Additionally, dirt and rust may be blocking the door from properly sliding along the track. Try adding lubricant to the track and see if it frees up the door. If you’ve tried all of the above suggestions and you’re still having trouble, it’s probably time to call a professional. There may be a broken spring, cable or pulley, or a host of other possibilities. If there’s a problem with electricity not reaching the door, you may have to contact a professional electrician to rewire the door or replace a circuit breaker. Don’t try to force the door – this will only make things worse and ultimately, more costly to repair. Once your garage door is repaired, it’s important to continue to maintain it. Proper maintenance will not only prevent future malfunctions and save you repair costs, but it will also add to the overall life of the door.